What Makes a Quality Bed Frame Foundation? Use discount code BESTSLUMBER100 at checkout to save $100 of your mattress purchase. This discount cannot be combined with any other offer. Affiliate Disclosure: BestSlumber may receive a small commission on sales of some of the featured products throughout the site. It is our mission to provide unbiased insight on how to find you the best possible sleep solutions. Tomorrow Sleep, a Serta Simmons company, introduced their memory foam hybrid mattress back in 2017. The major bedding manufacturer’s first entry into the bed-in-a-box arena was an immediate success. Fast-forward to spring of 2018, They have now added a spring-less memory foam mattress to their lineup. Tomorrow Sleep was kind enough to let us review their new mattress. Continue reading and we’ll tell you everything you need to know to make an informed buying decision. Tomorrow Sleep has introduced a quality memory foam mattress at an affordable price. 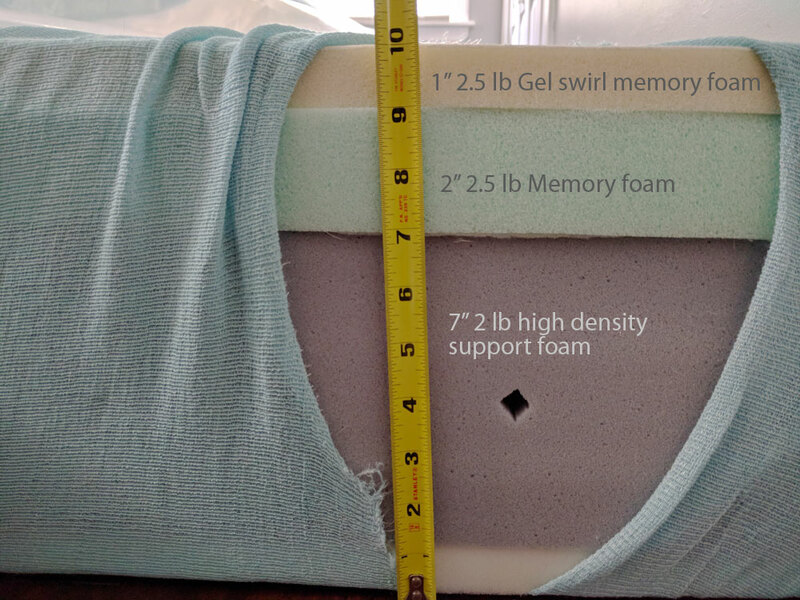 1″ 2.5 lb Gel swirl memory foam: This layer relieves pressure points by contouring to the curvature of your spine. This graphite infused foam also regulates body heat keeping you cool and comfortable. little to no motion transfer motion transfer. 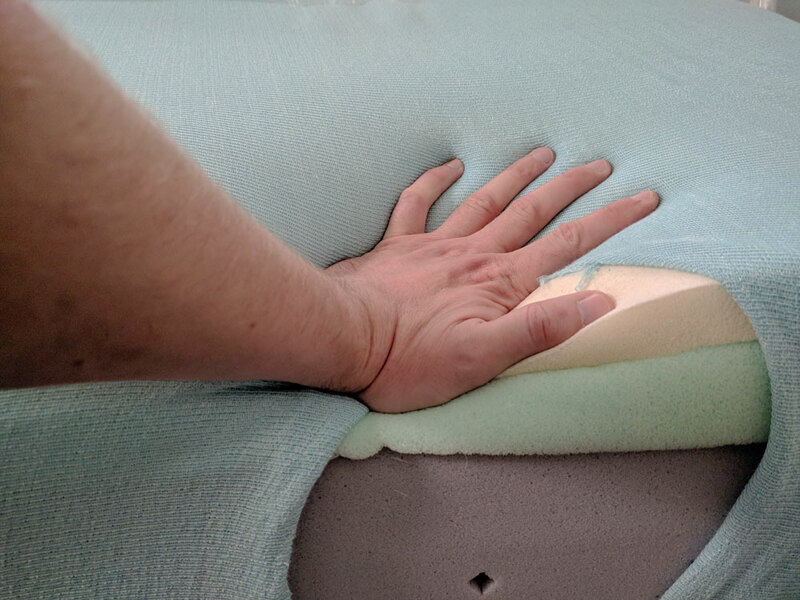 2″ 2.5 lb Memory foam: This second layer continues to dissipate heat as well as offer pressure relief and limit motion transfer. 7″ 2 lb high density support foam: The base layer offers structure and push back that adds to overall comfort and durability. Note: It’s essential a Queen or King have a frame with a sturdy center support and additional legs on the ground. Over time, inferior frames can affect the support and longevity of your mattress. Overall rating reflects the combined scores of all values. The categories have been weighted in our calculations based on their individual importance. Quality memory foam layers rest atop solid support foam. We found this mattress to offer nice contouring that exceeds most beds in this price range. Pressing into the foam layers. While, we expected limited partner disturbance from a memory foam mattress, Tomorrow Sleep exceeded our expectation. Once again, this bed performed like mattresses costing twice the price. One small down side of any quality memory foam is that movement is a bit hampered. The same conforming qualities that make this mattress so pressure relieving can make movement more difficult. Memory foam takes longer to bounce back than latex or traditional coil mattresses. You tend to sleep in it rather than on it. While this type of foam has a history of sleeping warm, graphite infused memory foam sleeps cooler. This bed is CertiPUR certified to not emit dangerous chemicals into the air. We noticed only a mild “new” scent upon delivery. This quickly dissipated within a few days. Dense memory and support foams provide solid structure and durability. Not surprisingly, edge support is not a strong suit here. Memory foam mattresses seldom impress in this category. 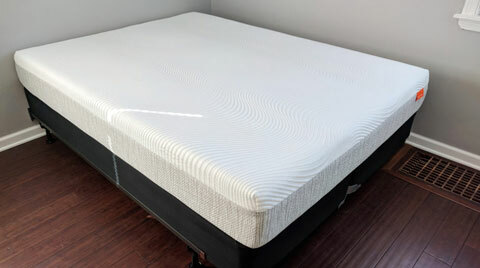 If you like pressure relieving feel of memory foam but want a more solid edge, consider a hybrid. Tomorrow Sleep offers a full 365 Day Comfort Trial. If you are not fully satisfied with your mattress, return it free of charge for full refund! This adds great piece of mind and helps make your purchase decision easier. 10 Year Limited Warranty: Standard disclaimers apply; See manufacturer's warranty information. Shipping is free to your door in the continental U.S. Tomorrow Sleep does offer a white glove delivery that includes in home delivery and set up. The fee for this service varies on your location. In general, memory foam mattress do not rate high in this category. These beds have less bounce and push back than traditional mattresses. Movement is also more restricted. This mattress is an exceptional value. Dollar for dollar, one of the best beds we’ve tried. While there isn’t one mattress that will be right for everyone, a medium firm is designed to appeal to the majority. It’s firm but, with just enough body contouring to appeal to most sleepers needs. Most back sleepers will appreciate Tomorrow Sleep’s not too hard, not too firm feel. There’s enough firmness for proper alignment while allowing for a comfortable amount of contouring. The combination provides support and pressure relief. This medium firm feel will accommodate most but, not all side sleepers. If you have extreme pressure sensitivity and prefer an ultra plush feel, this mattress may be too firm. If this describes you, we strongly recommend considering Tomorrow Sleep’s Memory foam hybrid. We found this mattress to offer exceptional comfort while on our stomachs. This has not been the case with many memory foam mattresses we’ve tried. Often times, you sink too deep; allowing your lumbar to dip and cause lower back pain. The medium firm feel offered pressure relief with just the right amount of support. Low Motion Transfer: Our evaluation found little to no motion detection. This is a great asset for couples. Sleeps Cool: Cool Swirl and Airy Comfort Memory foam regulate heat and keep you sleeping cool and comfortable. Pressure relief: For those seeking that mid range firmness level. This memory foam option offers great contouring and comfort. Great Value: The Tomorrow Sleep memory foam is priced far lower than comparable mattresses. A name you trust: Tomorrow Sleep is backed by the Serta Simmons company, the largest bedding manufacturer in the world. Tomorrow Sleeps 365 Night Comfort Guarantee gives shoppers extra peace of mind. Only One Firmness Option: The Tomorrow Sleep memory foam mattress will accommodate most but not all comfort preferences. It may not be the right bed for those seeking extremely firm or extremely soft mattresses. Foam (spring-less) mattresses are not for everyone. 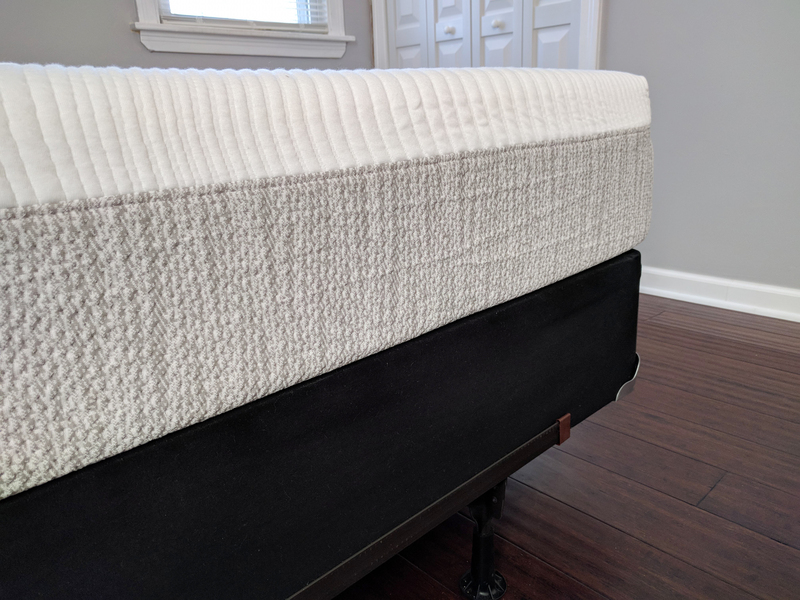 Although a very popular choice for many, some still prefer the more structured feel of a coil spring mattress. This comes down to personal preference. Ease of movement is limited: You sleep more “in” memory foam than “on” it. Couples who don’t want to disturb each other’s sleep will appreciate low motion transfer. Your movements will go virtually undetected through the night. 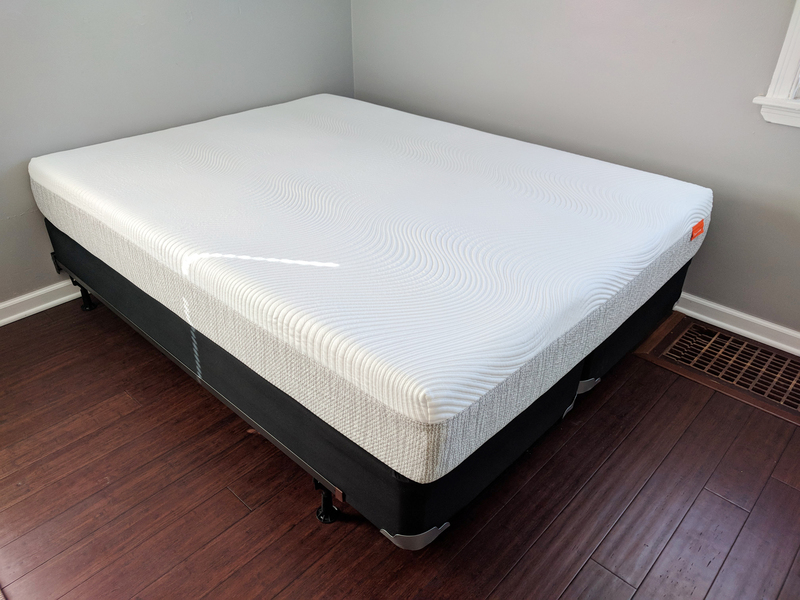 We noticed little to no partner movement during our trial of this mattress. If you like the feel of memory foam but are concerned it will sleep too hot, Tomorrow Sleep is for you. Graphite infused memory foams don’t retain heat like similar foams have in the past. You’ll get all the benefits of memory foam without overheating. Those seeking great pressure relieving conformity will like this mattress. Tomorrow Sleep’s memory foam contours nicely to the shoulders and hips. It softly cradles your body while keeping you well supported. If you’re looking for an affordable memory foam mattress, Tomorrow Sleep offers quality not often found at this price point. Those who want to feel confident in who they’re buying from will feel at ease with this purchase. Tomorrow Sleep’s memory mattress is backed by the Serta Simmons Company. For those needing more convincing, It also comes with a 365 day comfort trial period. People who just don’t like the feel of an all foam mattress will most likely do better with an innerspring. This bed will provide a true memory foam experience. If you prefer the “push back” feeling that coils offer, you should consider the Tomorrow Sleep’s Hybrid. The hybrid will still give you great pressure relief but, adds an individually pocketed coils system. This gives a more substantial structure that fans of traditional spring mattresses will appreciate. Those seeking significant edge support should stick with an innerspring mattress. Compared to other all foam beds the Tomorrow Sleep’s edge support holds its own. Limited edge support is a characteristic of spring-less beds, not a flaw. If you like a structured feel you may be better off with an innerspring mattress. If you are looking for an extra firm or an extra soft feel, this will not be your mattress. Tomorrow’s memory foam strikes a really nice midrange that should appeal to most comfort preferences. Those looking for an extremely firm or ultra plush feel should consider other options. This mattress weighs considerably less than their hybrid model. One person could handle this bed by themselves. However, it’s still easier with 2 sets of hands. Once moved into the room it will be slept on, setup is relatively simple. Start to finish, the process took around 10 minutes to complete. After removing from its box, we recommend placing your mattress on its platform before unwrapping. 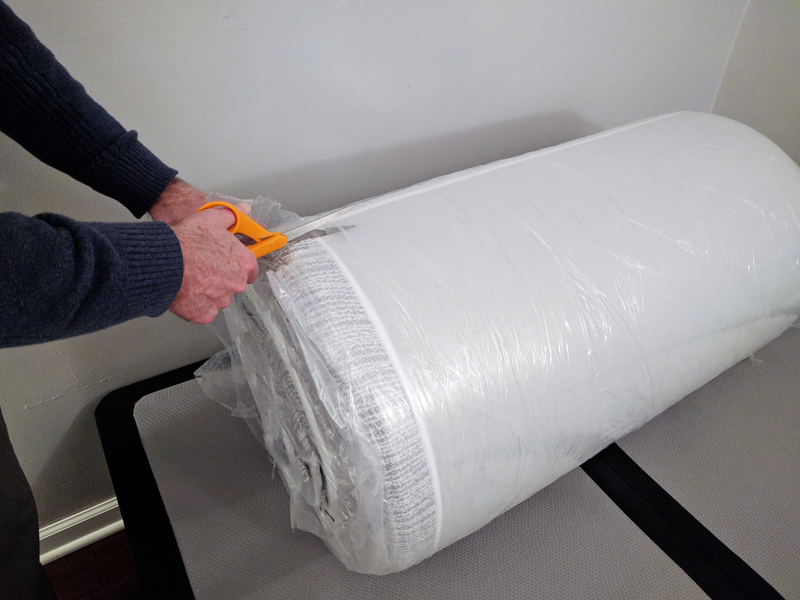 Begin opening your mattress by cutting through the first layer of the plastic packaging. Take care not to rip the fabric cover. As the vacuum seal is broken, air will quickly rush in; allowing your mattress to expands. Your mattress will typically take an hour or so to fully expand. However, actual time can vary depending on outside temperature. Memory foam is heat sensitive and may require additional time to warm and soften. On the day of our delivery, it was around 20 degrees Fahrenheit. Coming in cold off the truck, it took an extra few hours for our mattress to acclimate to room temperature. Tomorrow Sleep continues to redefine value expectations for online mattress shopping. Backed by the Serta Simmons Company, Tomorrow Sleep’s Memory Foam offers exceptional quality at a great price! Supportive and pressure relieving, Tomorrow Sleep’s memory foam mattress strikes a perfect balance between money spent and quality received. Our objective is to provide clear, honest evaluations of the widest range of possible sleep options. Learn more about us and our evaluation process. Join our email list for new product updates, promos and giveaways.